Which Pur Product Do I Use Every Day? You are here: Home / Beauty & Fashion / Which Pur Product Do I Use Every Day? Normally when a merchant sends me a free product to do a review, I try to get the review up as soon as possible. This time I took 6 weeks! Did I feel guilty? A little. But I had a good reason. Many times when I try a product out quickly I like it because it is something NEW but over time I don’t end up liking it as much. I wanted to try out these products from PurCosmetics completely before I reviewed them. The result was that I have started using one of them almost every single day. But you’ll have to read on to find out which one and why! Pur Dirty Girl: Let’s start with the Detoxifying Mudd Masque with Pascalite Clay. It says that it unclogs pores, clarifies, and cleanses. I tried it first one day after getting out of the shower. When they say “mudd” they do mean “mud”! The masque was the color of dirt but definitely smelled better. It went on smoothly and I found myself wanting to put on more and more because it felt good as I smoothed it on. You’re supposed to leave it on 5-20 minutes. I left it on about 10 as it was starting to harden. The one thing that I didn’t love about it was that it was hard to remove. That is the case, however, when it comes to most masques of this kind (as opposed to the peel off). So from then on I started putting it on BEFORE my shower and then just rinsing it really well in the shower. What was the result? My skin felt so smooth that I didn’t even want to put makeup on after it. I ended up using a little serum that day and nothing else. The obvious effects of the masque wore off after a couple of days, but I am sure from a skin health standpoint, they lasted longer. Would I use it every day? No. But you don’t need to! I have been trying to do it about every other week when I think about it. And this tube looks like it is going to last awhile. Pur Cease Crease Eye Shadow Primer: Next up was the eyeshadow primer. I do use primer on my eyelids when I am putting on full makeup, so I sort of knew what to expect. My biggest tip for this is that it comes out fast and you don’t need much, so the tube will go further than you think it will. It went on white (I kind of like tinted primers better) but the coverage was nice and my shadow applied easily over it. Would I use it every day? No. But that’s because I don’t wear eye shadow every day and even when I do, I am not always concerned about how long the shadow will stay on. For me this is a 1-2 times a week treat for when I am doing my full makeup and need it to stay more than a few hours. Will I replace my other primers with it? Not likely but I don’t really have any that I am married to, so I would say I like this one just as much. 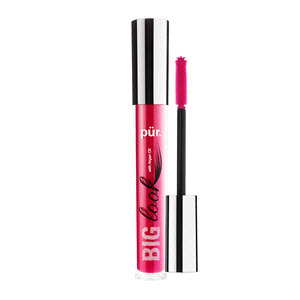 Pur Big Look Mascara with Argan Oil: Now we get to the part you really need to know about. I am a mascara junky. I love trying new mascaras and my light, thin lashes can use all of the help that they can get. I love full (almost fake!) looking lashes when I put on my mascara. With one coat of Big Look, I got nice even coverage and color. It sounds weird but I could almost feel the Argan Oil as I slicked up my lashes. It was a perfect look for daytime when I tend to wear only CC cream and mascara. For nighttime, I use two coats on the top and really thicken it up. It’s beautiful! I love this mascara so much that I used the whole sample tube and ended up buying myself another full one. I’ll probably continue using it, and it is replacing the last mascara that I was using. I also bought myself a waterproof version of it for swimming. I don’t love that one as much because it is stickier and part of what I love about this one is how smooth it is. But I’ve only used it twice so far. Would I use it every day? Yes! In fact, sometimes twice a day. The next time I order, I’m going to get one for each of my teenagers as well. Like me, they are contact wearers so I am very careful about what we put on our eyes. Pur is perfect with its vitamin E, antioxidants, and omega 3 and 9 fatty acids. I have seen less breakage of my lashes since I started using it. I’m not sure if that’s because of all of those ingredients or because it removes so nicely. Either way, I will take all the help I can get. So there’s my review of 3 great products from Pur. One was a game changer for me. One was pretty great and I look forward to continuing to use it every week or two. And one was nice but not an absolutely necessity. I’m keeping my eye on their site for sales so that I can try out their primers and foundations next!